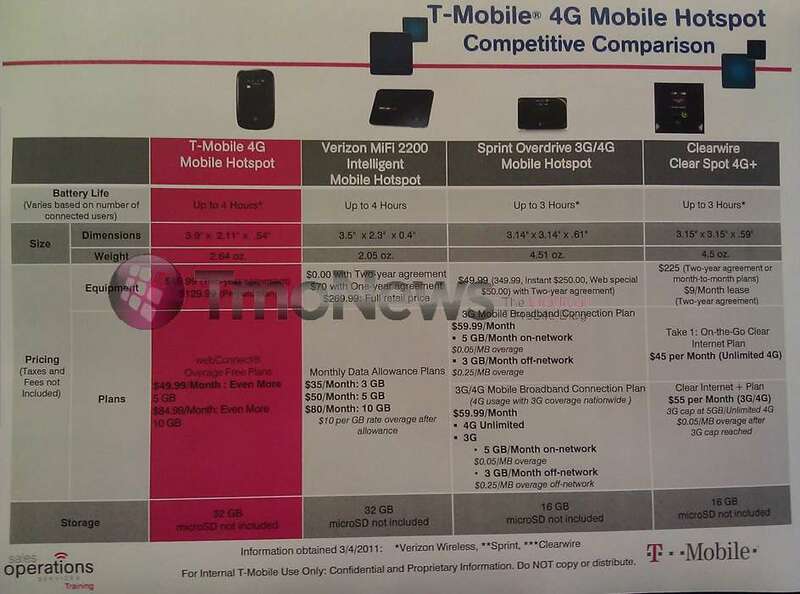 With the introduction of their very first 4G Mobile Hotspot in two days, T-Mobile dropped a comparison sheet showing how their new offering compares to the Verizon, Sprint and Clear competition. To be honest, it doesn’t exactly appear to give T-Mobile the edge as Verizon bests them by $4.99 on the 10 GB monthly data allowance along with Sprint and Clear providing unlimited 4G data for $25 and $29.99 less respectively. In any event T-Mobile will introduce their very first Mobile Hotspot in just two days and with that, enter a brand new market space with the hopes of capturing a little bit of that market from Verizon and Sprint. Of course if you are already an existing T-Mobile customer with a voice plan adding a webConnect plan and the 4G Mobile Hotspot will net you 20% off the $84.99 or $49.99 plans. Anyone notice AT&T’s conspicuous absence from this list? Oh right…they need more spectrum. ← T-Mobile 4G Mobile Hotspot Arriving This Wednesday? AT&T has provided a MiFi for two years now. They offer a Novatel MiFi on their website. What the hell are you talking about? AT&T just came out with their first MiFi a few months ago. You are correct sir, still their absence from this list is conspicuous. I find it questionable why they aren’t on this list? They’re on the list. They’re just going by a different name. They’re the first column (the magenta one) that says T-Mobile 4g hotspot. Probably because the documentation is for 4g mifi only. HA! T-Mobile’s own comparison sheet makes them look stupid…siiigh. No wonder they got bought out. i thought i read something about 20% of the MBB plans if you also have voice service with TMO? Please rotate the watermark by 90 degrees so that the column I care about is completely obscured. The 20% discount is where the savings come in place. I still think its over priced to me. Runs amazing and smooth but just a little out of place. IMO it should be $50 unlimited 10 GB throttle. I think the throttling is better than overages any day..
I’d like to have both options, get throttled at first and have the ability to pay if you need more speed. Understandable and I do agree but I believe that my company feels like they are giving you a choice for up to 10 and doesnt want to deal with overages. Even as an option. You might want to rethink that last line David..
At&t is not there. No HSPA+ yet.. maybe not at all. If the deals is rejected T-Mobile will get spectrum, coverage where they don’t have any, and punking at&t for 3 billion in cash money. Damn that’s a straight hustle for the Germans! Go Magenta!! I’m thinking this is a very niche product. Not something the average smart phone user would even consider at an extra 50 bux a month. Looks like T-Mobile has the worst offering. But those prices don’t reflect the 20% discount existing T-Mobile customers would receive so they’re actually better off. Too bad there a lot of mobile broadband users who don’t have cell phone service with T-Mobile. For example me. My phone is cheaper with another carrier but I’d like to get mobile broadband through AT&T or T-Mobile because I like using the modem in other countries (GSM). Right now, I’m on AT&T’s 10 GB plan. I was researching about T-Mobile’s offerings and found myself here. Well, I found out AT&T is better than T-Mobile. Search done. Hello. They are comparing the TMO 4g to the Verizon 3g!! The 4G is the same price and data rates. Anybody have the URL of a verizon fanboy page cause I am outta here!!!!!!!!!! !